Welcome pop pickers! A post I have meant to do for the last few years on Graffoto has been a look back at the year, be it a good or a bad one. The problem in previous years was that I just always ended up leaving it too late in the holiday, my bingo wings thus being held down by my own weight in mince pies and turkey leftovers and sapped of the energy to bother. So whilst the intention this year was to start this post pre Christmas in the hope it kicks me up the arse to finish the rest closer to the end of the year, here I am a couple of days away from New Year's.... So it's more than likely that this will be a post that carries over into 2012. I'll split the year into 4 parts so as not to make the post so long. A picture heavy and word "lite" effort it's about my third post of the year and certainly the biggest on Graffoto. My favourite pictures and work that has gone up throughout the year, starting right at the top of January. . .
All pictures are by HowAboutNo except where stated. Milo Tchais also getting up more than I remember in previous years. 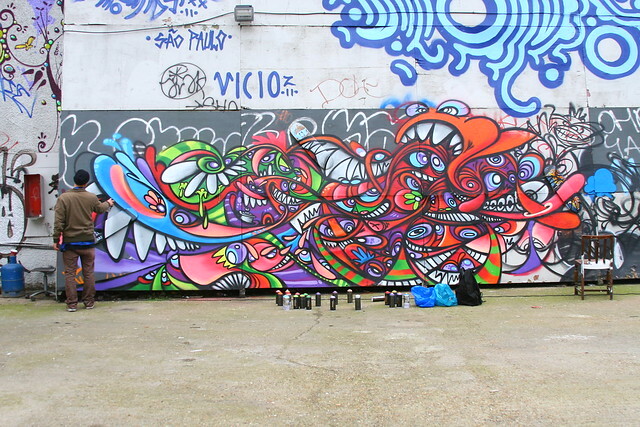 In fact this whole spot got a lot of action in 2011, Mr Sperme popped up and knocked out this one. Shame there weren't many others. 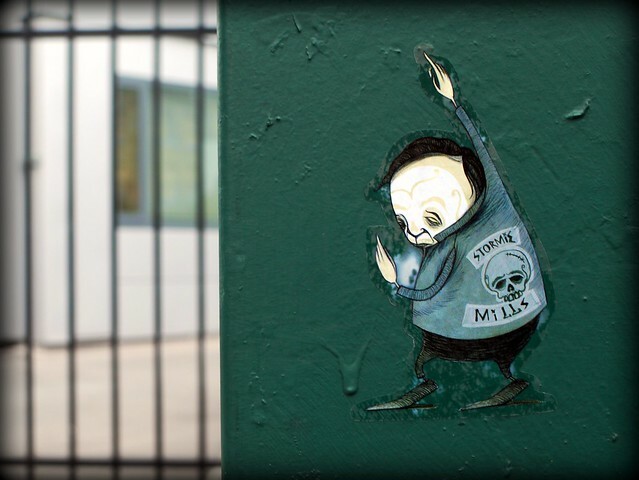 Ranking highly as my fave piece of the year...and it's a sticker :( Sadly Stormie Mills didn't paint any London walls that I found in 2011. Slipping in a little bit of South Coast action . . .I found a nice little spot closer to home in Hastings. Unfortunately I have only managed to go there once with a camera in hand. Must change that in 2012. Michael De Feo had a show in London and left a few flowers. 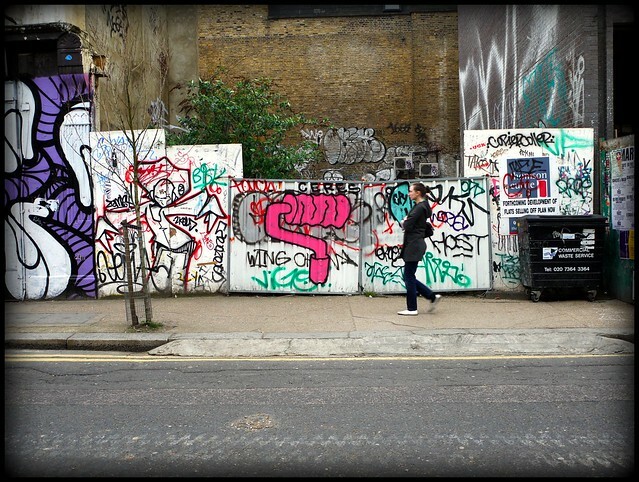 A few artists hit the Grand Union Canal at Broadway Market one weekend in March, am not sure there was any event other than perhaps a meet at a local hostelry. . .
Just oodles of generic damage was often my highlight of the year...more in later posts but this was a big big fave. 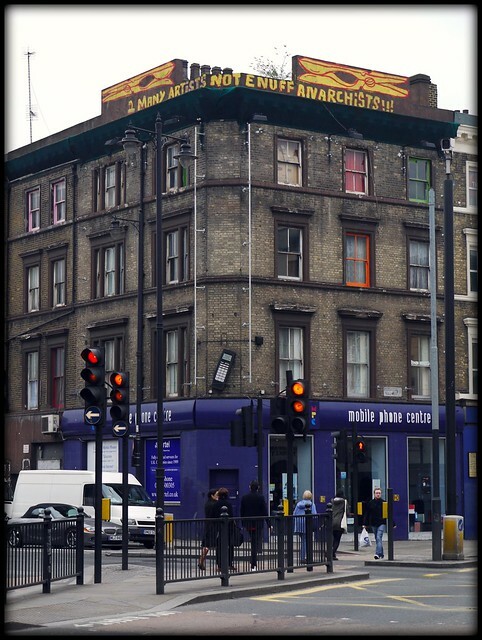 . .
Gold Peg did a few activist/occupy related pieces through the year (more later) This was the first and boldest, the ad company blocking the message out days later. 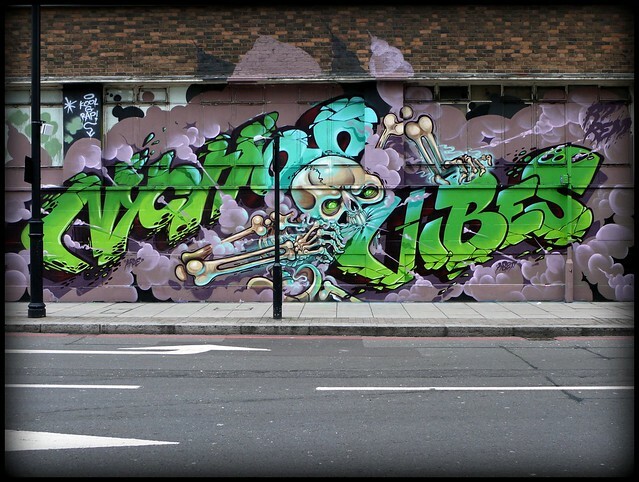 Tizer went to Leake Street and did this piece in amazing quick time. I think the squiddlywinkswould call this one SICK! Gold Peg hit some of the most eye catching and clever spots throughout the year as far as I am concerned, proving as always that half, if not more of the work is all in the placement. So that's it for part 1 of this round up which covered January to March (at least in the order I found them, as mentioned some of the pieces are years old) Part 2 to follow soon covering, you guessed it......April to June. Tis the season to reminisce and having just past the shortest day of the year my bones fondly recall the warmth of a gorgeous late Summer’s day in Cardiff when I came across a stunning piece of “trick of the eye” art by Felice Varini. The technical term is "anamorphic", it's an ugly charmless looking word, clumsy on the page and a bugger to explain yet what it defines can be amazing. 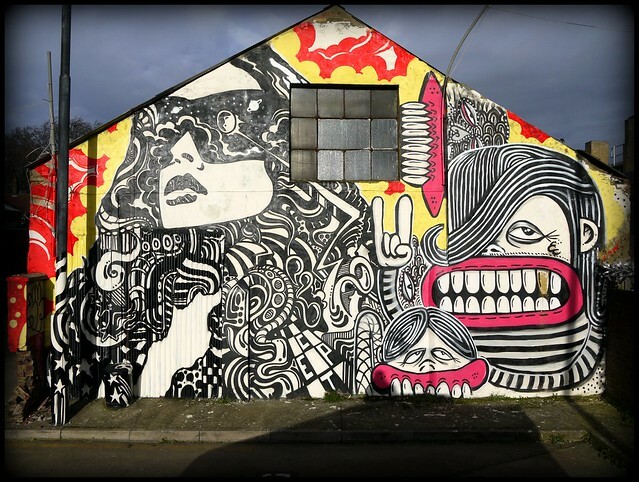 We understand it mainly from the context in which it is used and that, so far as street art is concerned, is generally those road and shopping mall 3D illusions of gaping chasms where smooth tarmac or faux-marble should be. 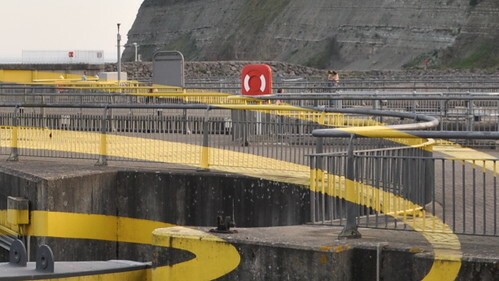 Back to Cardiff, a rare return to the land of my fathers, I was gobsmacked to find out his “Three Ellipses For Three Locks” was created over about 10 days back in mid March 2007. 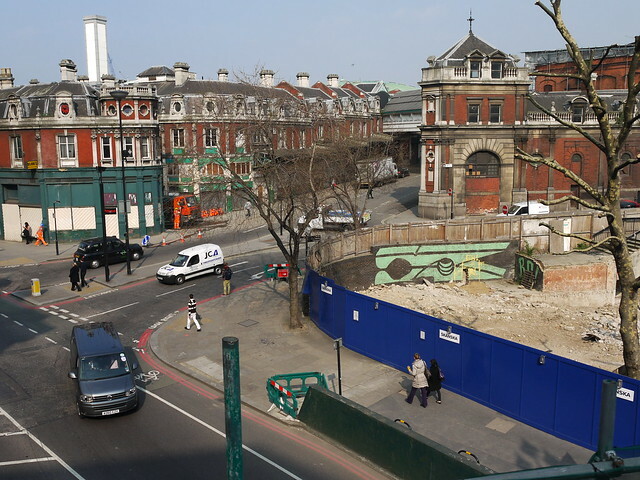 It hardly need be said that a lot of maths must go into calculating the geometry to fit into the available structures, and then a lot of surveying to determine exactly where to paint. The shapes appear as perfect closed ellipses except for one small section where techniques for painting permanently on water are not yet sufficiently evolved. 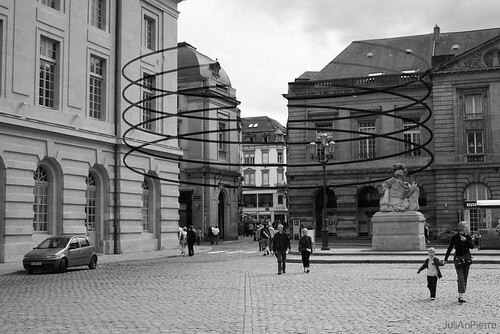 The optical illusion persuades the eye that the shapes are perfect ellipses painted on a transparent vertical plane in front of the viewer, they actually appear to lift off the surface on which they are painted and sit in mid air. 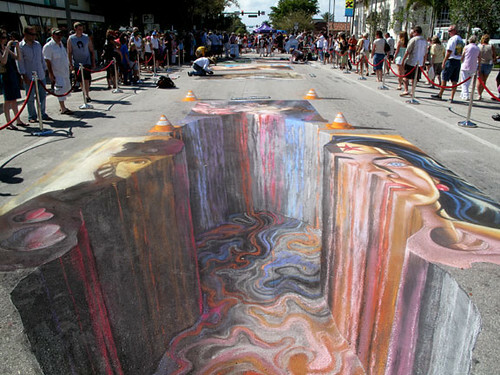 The effect is giddying, this is high impact art, who needs drugs huh? 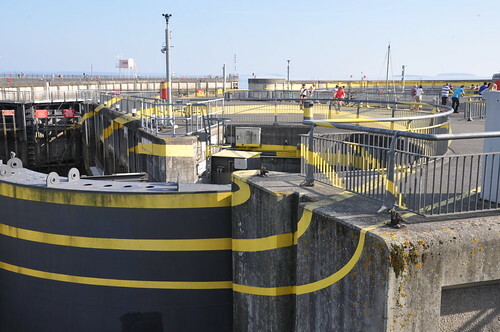 As the painted surface recedes and the line leaps from a surface 10m away to a plane 50m away the visual connection is seamless, the line retains precisely the same thickness so far as the viewer is concerned. 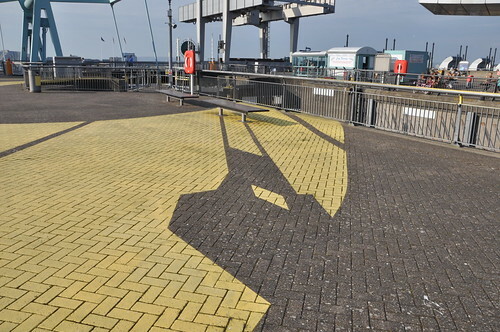 The trompe l’oeil effect works properly at just one precise point at a bridge crossing a lock system letting yachts in and out of Cardiff Bay, the now dammed estuary where the Rivers Taff and Ely flow out to meet the Bristol Channel. 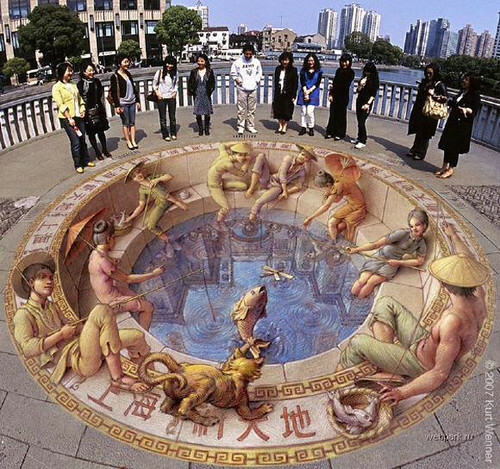 Moving around shows the amazing effects created by the painted lines. 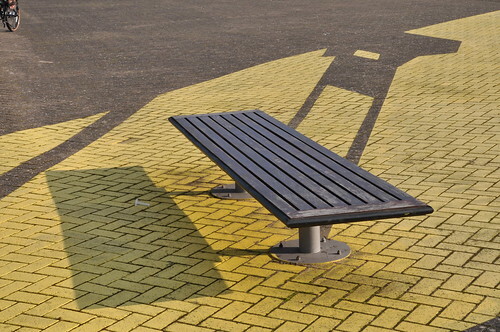 No paint is wasted, the effects of shadows cast by intervening structures are themselves intriguing abstracts, check the real and the Varini shadows thrown by this bench. 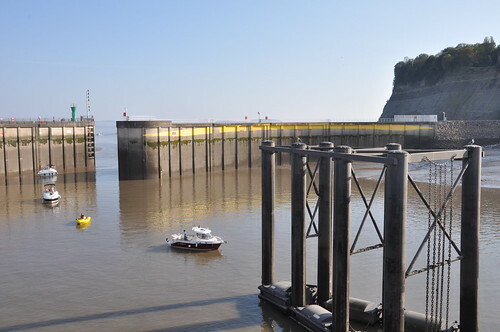 Many will be familiar with the fact that the Bristol Channel has the second largest tidal rise and fall in the World. 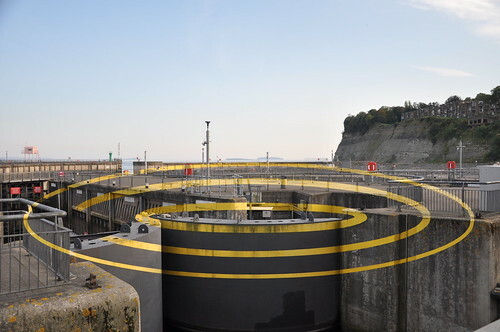 The depth of the lock system necessary to accommodate this huge range can be seen in this shot of the furthest extremity of the Varini circles. Smart-arses and Barnacle Bills reading this far (ha ha!) may object that the last paragraph tells the average reader who isn’t a member of Cardiff Bay Yacht Club nothing without further information on how long before or after low tide the photo was taken but what do you expect, an Ocean Yachtmaster lesson as well as art?? 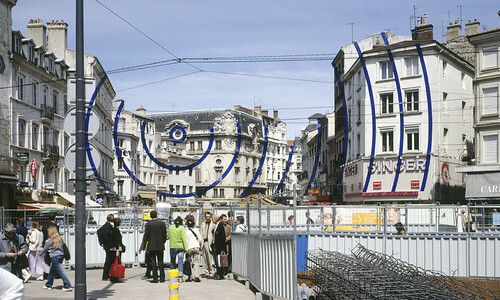 More examples of Felice Varini’s work on his website here. It has been a while since Graffoto’s last penetrating insight into walls damaged by Banksy. Those Banksy posts were easily mistaken as springing from passion for street art when in fact the intention was to publicize Shellshock's brilliant gift sized tome "Banksy Locations and A Tour" which is currently available at the crazy smackdown price of £7.50 inc P&P (UK only) if you go to Shellshock’s online shop here and type in the sneaky hidden code "shoptilyoudrop". 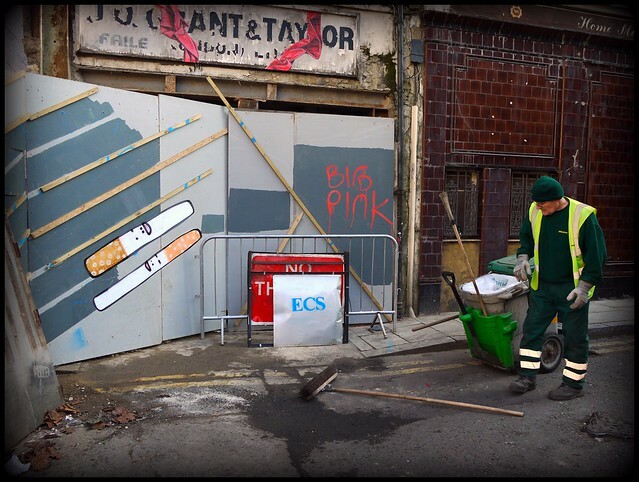 The main reason we haven’t written much about Banksy is there is generally little to say that isn’t bleedin’ obvious from the image but his recent stuff raises a few thoughts. 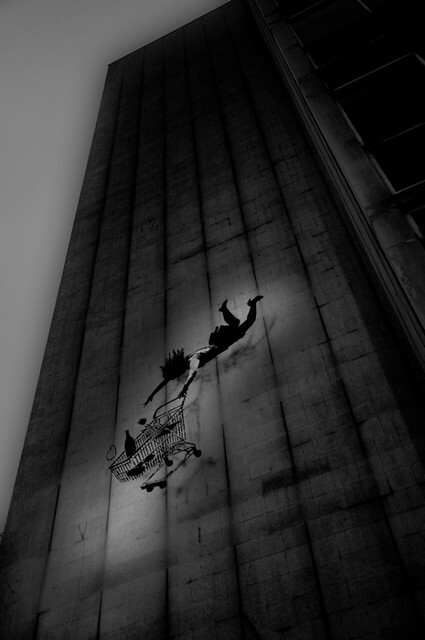 Close by Bond Street in the heart of the UK’s most extravagant perpetual consumer fest, Banksy took advantage of a very tall wall on an empty building to create this beautifully executed falling women and shopping trolley. Its height and scale give a real sense of peril and plunge to the piece. The drop shadow Banksy has painted on the wall give the piece an attachment to the wall, shadow is a clue telling us she is meant to be falling down the wall rather than it being a picture of her falling through mid space. Up in Liverpool we came across this vapour trail love heart. 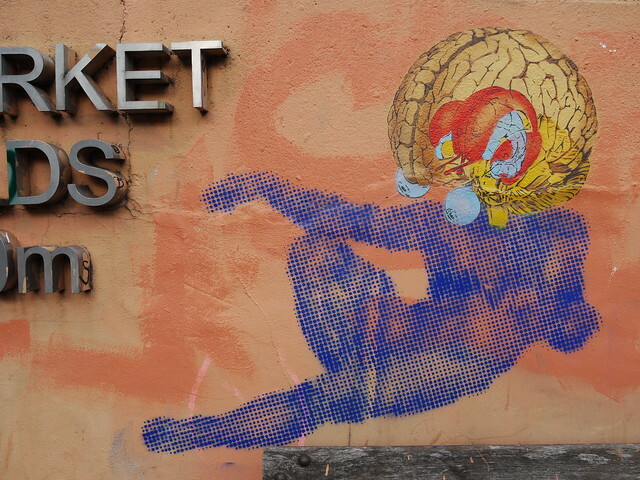 Using stencils, spray can and fire extinguisher as the medium, this wasn’t a quick stencil reach. 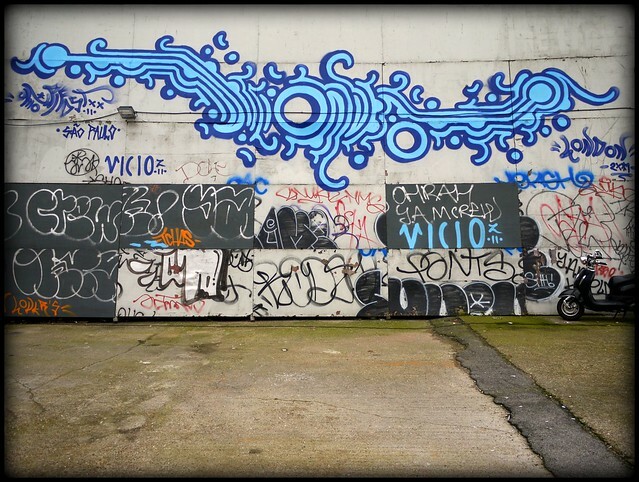 The plane is beautifully stencilled, the black layer over the white layer has the feel of a Banksy and to clinch it*, the identical composition has been found this week in East London. 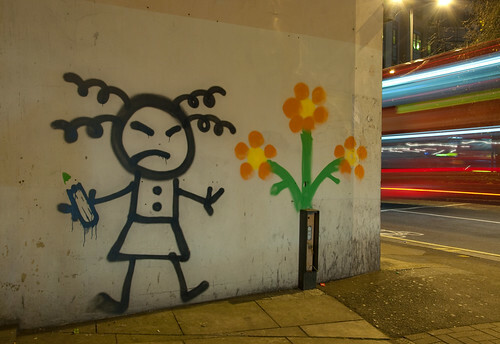 Only Banksy has operations with the scale to pull off such stunts. We tend to think of Banksy as a flat stencilist, painting the stencilled areas with solid fill but Looking closely at the plane Banksy has applied a fade along the fuselage nicely blending where light falls on the upper surface and gradually turns to darker shadow underneath. 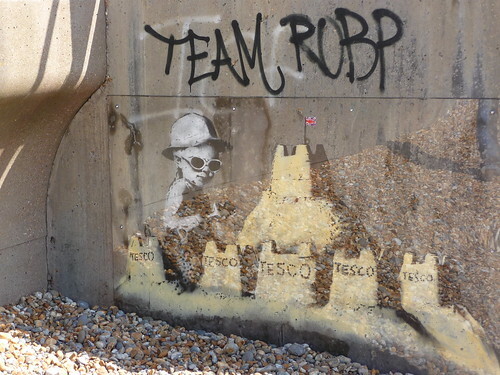 A similar fade and graduation was evident in Tesco sand castles in St Leonards. 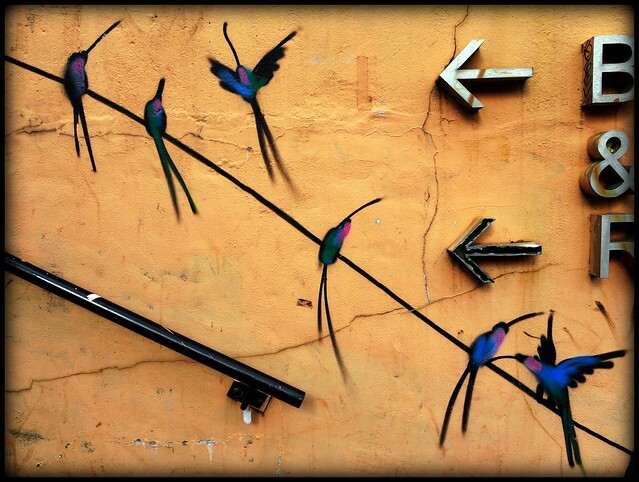 The curious thing about the love plane image is the application of a drop shadow on the wall, it has a radical impact on the picture. Without a shadow, this would be an image of a plane in the sky creating a love heart. 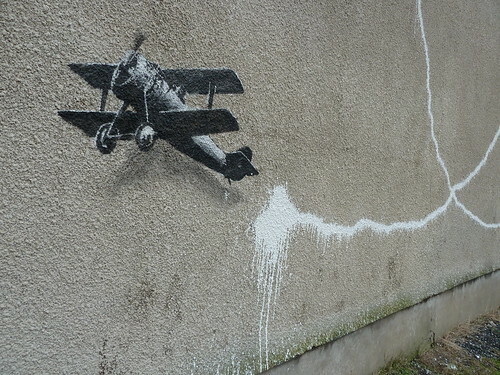 However, with the drop shadow added the plane is now pulling off some kind of acrobatic stunt along the wall, it becomes a picture of a plane flying down the side of the wall painting it as it goes. 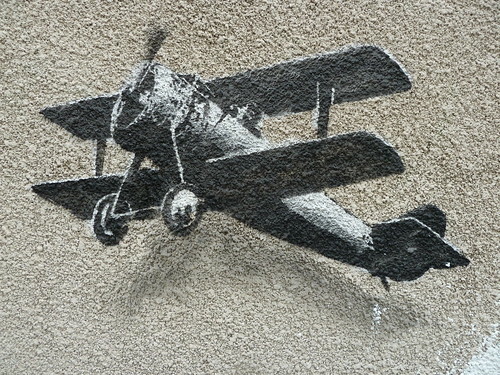 With Banksy, nothing is accidental so what did he intend by flying his bi-plane down the side of the wall? 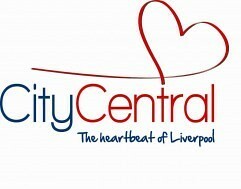 Another curious feature is a stunning similarity between the heart in the Banksy piece and the logo of a sinister Liverpudlian mind manipulation cult called City Centre, a sort of tourist board for shops and “attractions” in the centre of Liverpool. 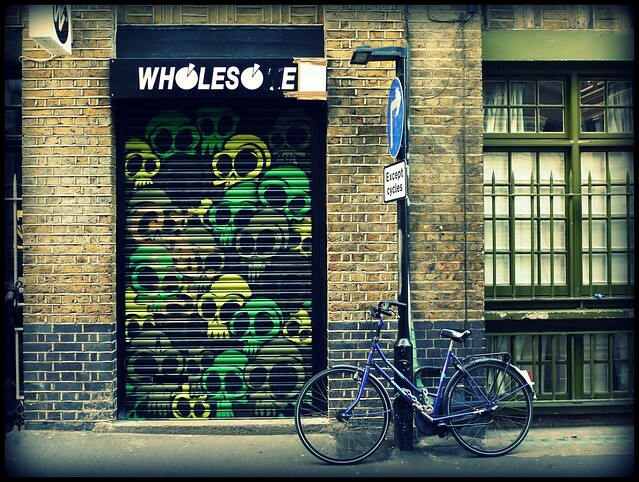 The similarity seems too striking to be coincidental and the image is located in the heart of the zone promoted by “City Centre”. 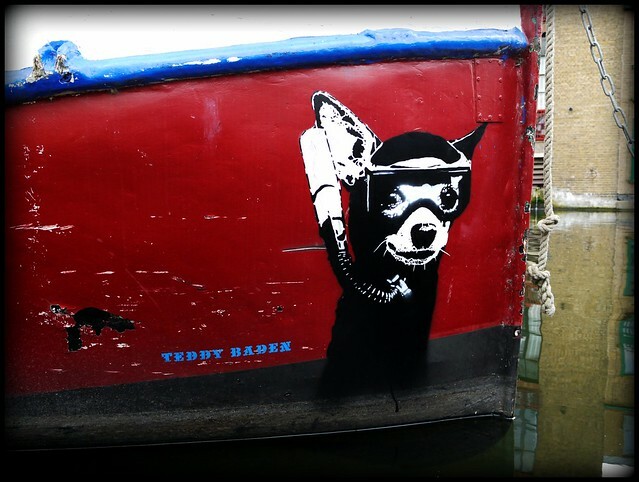 If Banksy meant the heart to allude to something specifically Liverpudlian, then what? 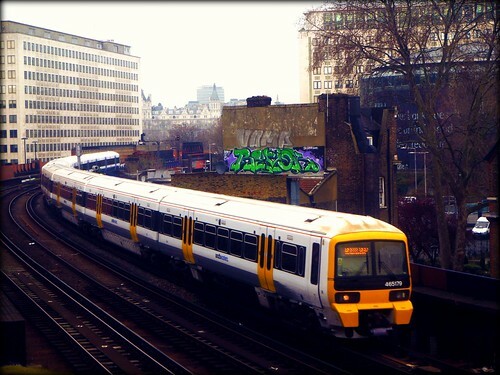 It may be that it is actually pure chance, I mean why would he put up the identical image in East London if it was intended to have a specific Liverpool resonance? Scousers – calm down and explain here. I like the way the plane is beginning its climb to the heavens just yards from a street sign obligingly directing the plane upwards. This interaction with its environment is a far better take away than the idea of its location in an area hyped by an organisation using the same heart motif. 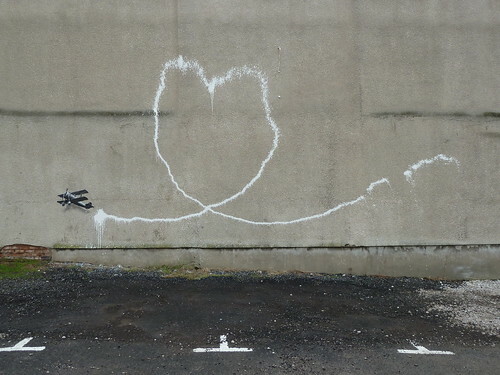 One for obsessives to anorak over is the rare use of a device such as an extinguisher or bicycle pump or something for the heart in this Banksy piece. 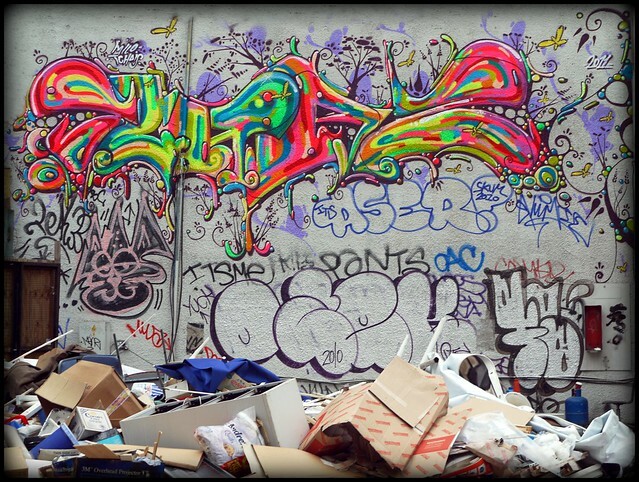 A fire extinguisher can be opened, filled with paint, re-pressurised and then used for artistic purposes as demonstrated here by Banksy. Filling a fire extinguisher with paint isn't for the faint-hearted but haven't we all at some time or another filled a bicycle pump with paint? 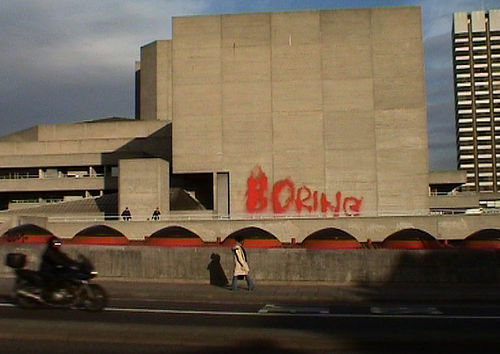 Graffoto put its collective brain cells together and finks the last time Banksy used a fire extinguisher was probably when he painted BORING on the side of the National Theatre in London. Photo nicked from someone who probably nicked it from someone else and so on. If this is your copyrighted photo, thanks for reading. Personally, I think this has been a strong year for Banksy during which he has created many new pieces in the UK and they haven’t been so blatantly related to product promotion like the Exit The Gift Shop stunts last year. 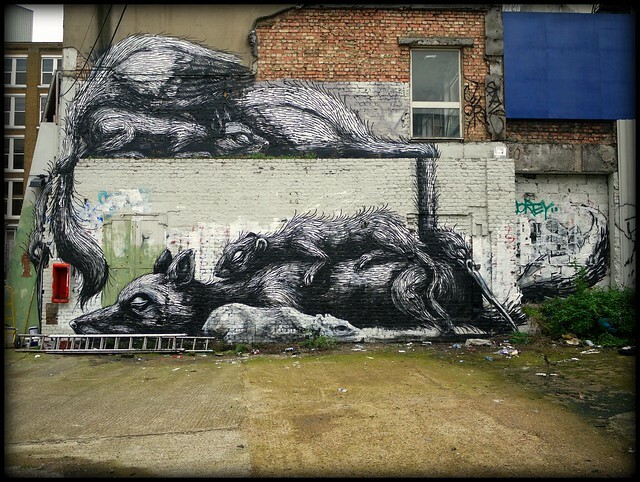 Many of the pieces have been "annointed" as genuine Banksy's by their recent addition to the photo section of his website. 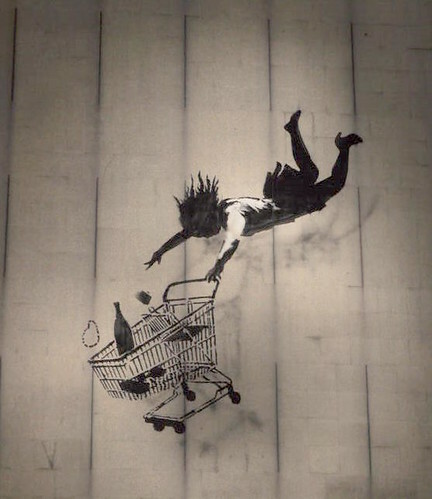 There never was much doubt that the Love Plane and "shop Til You Drop" were by Banksy. 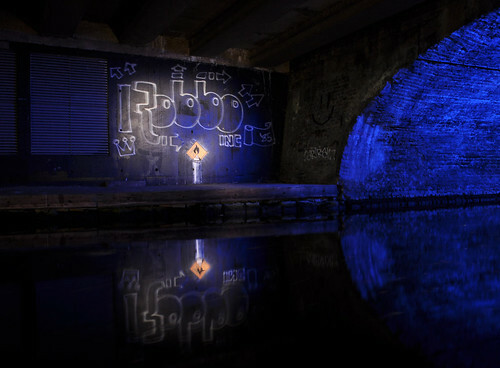 One around which there was much debate was the latest instalment of the Banksy v. Robbo Camden Canal saga which is now part of a photo story segment on his website. Another supposed possible Banksy which did very little for so many hasn't been blessed by an appearance on the Banksy website, though thats probably not enough to have its attribution updated to "unknown" which goes to show how little he needs to do to be perceived as having running street pieces. I have to acknowledge the help of Banksy experts Shellshock (have you noticed how cheap his book is at the moment?) and Art Of The State for help in aspects of this post and I apologise if they had preferred that had remained a secret.